Healthy Aging Alaska Style is dedicated to Healthy Aging. We believe that aging is a normal part of life and the ultimate goal is to be the healthiest, best you, at every age. No "anti-aging" talk and bemoaning of wrinkles here. Rather, we want to celebrate those "Lines-Of-Honor" because our faces tell a story. A story of lives full of experiences, high's and low's and wisdom gained that only comes with the details of our unique, individual journey's. But, of course, we can diminish those lines of honor, smooth your skin's texture and brighten your complexion giving you a glow at any age. Come in and get a skin analysis and let's create a skin care plan just for you. Or we can help your hard-working feet feel better, smooth those calluses out and shorten those nails to a comfortable length. Treat those feet with Tender, Loving Care and you too will have happy feet. 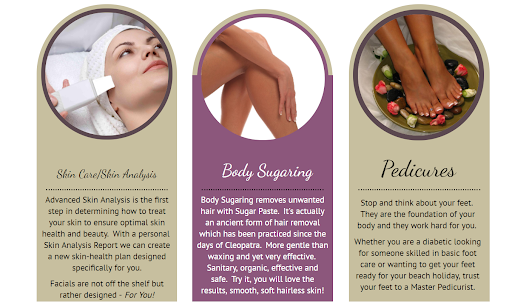 Lastly, if you want smooth, hairless skin, Body Sugaring is THE Premier form of hair removal. Gentle and yet effective beauty care service. Try it and you too will become a convert to this wonderful, ancient art/service. Our focus will be to partner with you to help you look your best, be your healthiest and feel great during the process.